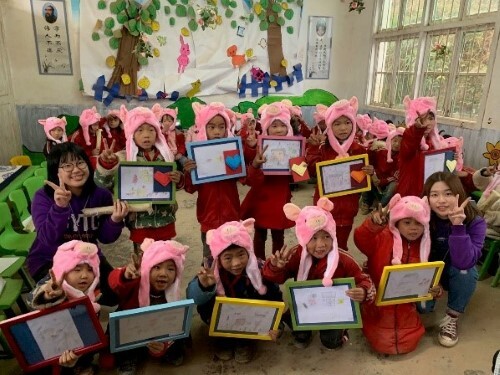 13 students from Cheng Yu Tung College (CYTC) led by Resident Fellow, Ms. Diane Lu went to Congjiang county of Guizhou province for Service-Learning from 19 December to 24 December, 2018. 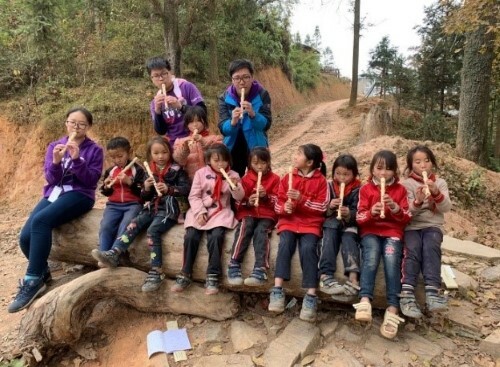 The purpose of the trip was to provide voluntary teaching and activities in a primary school called Dadai and also to learn local minority cultures by visiting Miao tribe and Dong tribe. 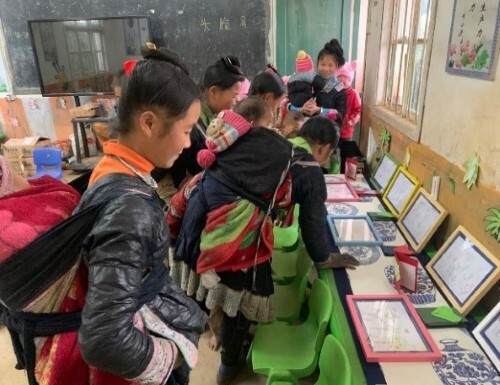 CYTC followed the Macao government project of poverty alleviation in Guizhou and before doing the services, the College used to have a field trip there last July. As recognizing their needs from local officials and principals, CYTC decided to do the services in Dadai primary school during the Christmas break. Dadai village is located in the mountains and most of the people are from Miao nationality. Dadai Miao people have their own language, cultures and sill live in a very traditional farming way. Lots of the parents are illiterate but fortunately some of them are aware of the importance of getting education. 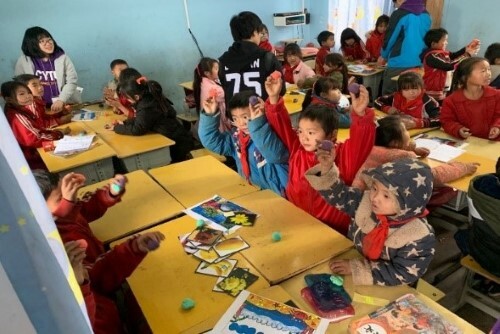 College members realized students of Dadai seldom have the chances to learn or practice mandarin, music, arts and physical education so they put efforts in preparing the teaching materials for those 67 students who are at Year 2. 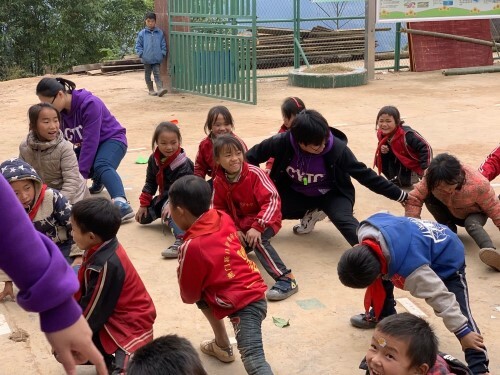 Unlike traditional volunteer projects or charity actions, Service-Learning programs contain designed learning plans, thorough preparation, structured reflection and concluding celebration. Last October, to understand the issues and challenges that Congjiang people might be facing, CYTC invited World Vision to talk about world poverty, Professor Hu from FED to talk about preschool education in China and UM students from Congjiang to talk about their hometown Guizhou and the minority nationalities- Miao and Dong. 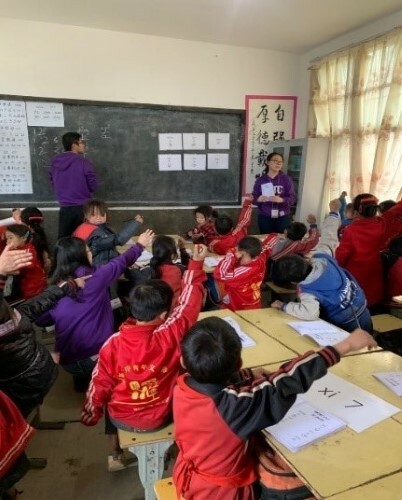 Under the mentoring and with the support by the college and College fellow, students performed quite well in the teaching and holding activities. At the last day of service, College students invited the principal and the community to join the celebration party. We witnessed kids’ learning outcome and celebrated with parents. Dadai kids were shy but happily presented their artwork, dancing and singing which they learned from CYTC students in those 3 days. 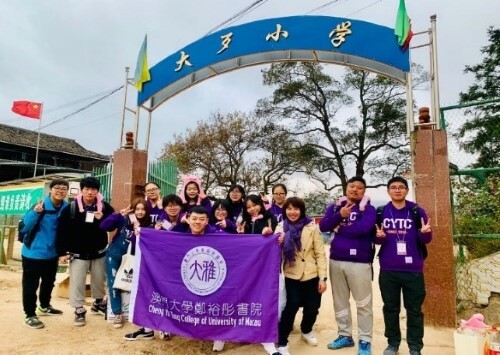 In addition to all the foregoing, it was great to see that CYTC and Chao Kuang Piu College do the preparation and then go to Congjiang together. Two colleges went to different primary schools, experiencing the teaching, local cultures and certainly had more people know more about University of Macau. One CYTC student Ms. Yang said, “To me, service is to give and learning is to be given. Service-Learning shall equally matter and exist at the same time. Undoubtedly we engaged in and also learned a lot from this program”. CYTC now plans to do the Service-Learning program again in the summer recess this year.